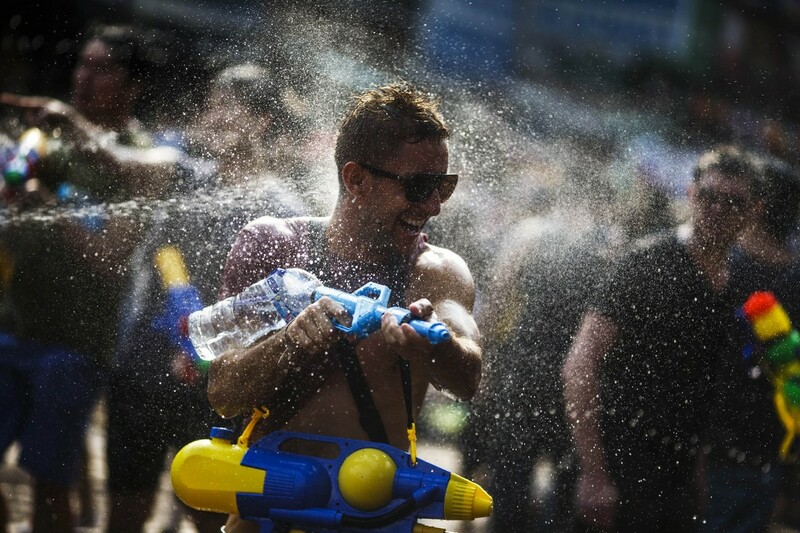 Tourists from neighbouring countries, mostly Malaysia and Singapore, take part in a water fight. 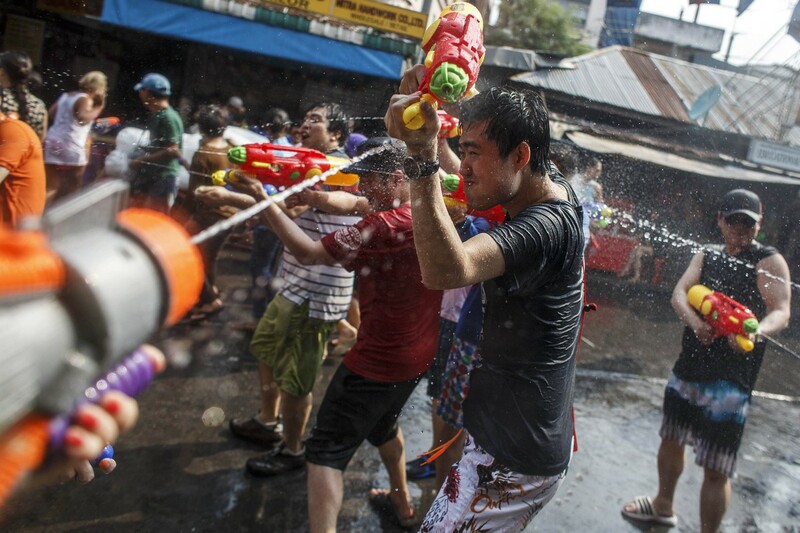 An informal Songkran truce appears to have been observed by those involved in the ongoing political conflict. 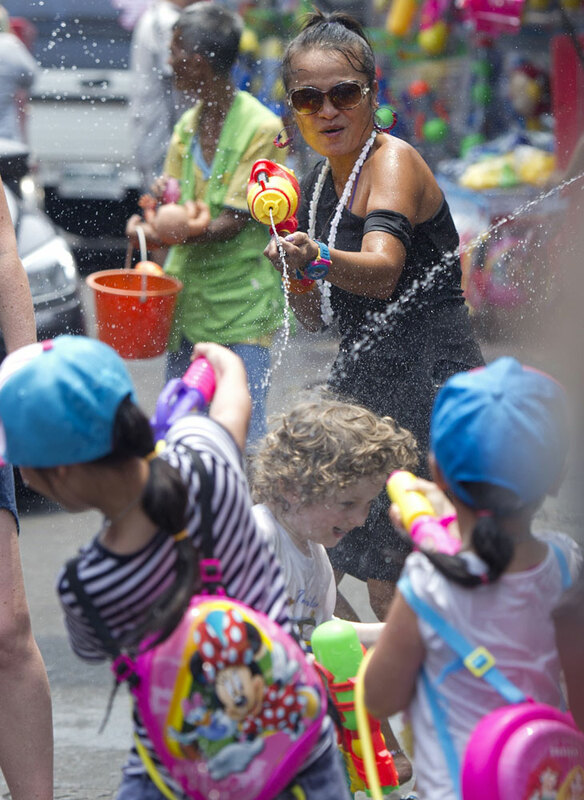 The Songkran Festival officially begins today though celebrations for the traditional Thai New Year started in many places yesterday - the first day of a holiday period ending Wednesday. 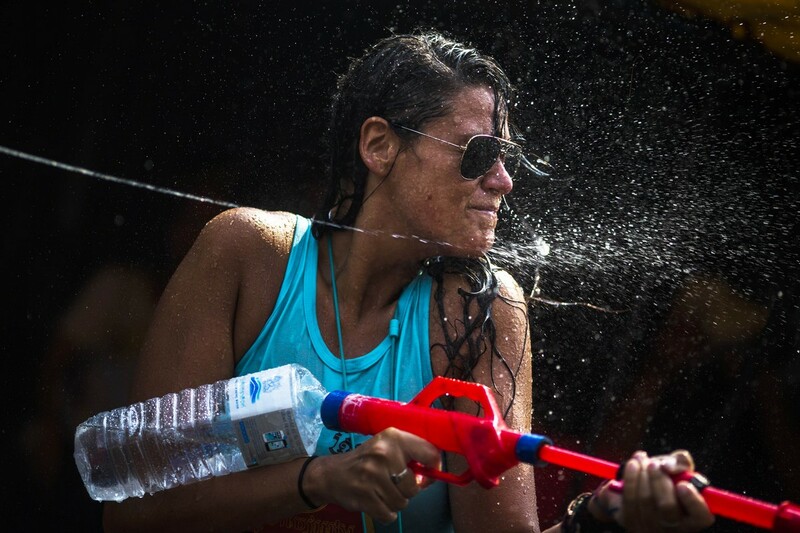 Foreign tourists at Bangkok's Khao San Road, dubbed the backpackers' capital of the world, took part in water fights with locals and fellow visitors yesterday. 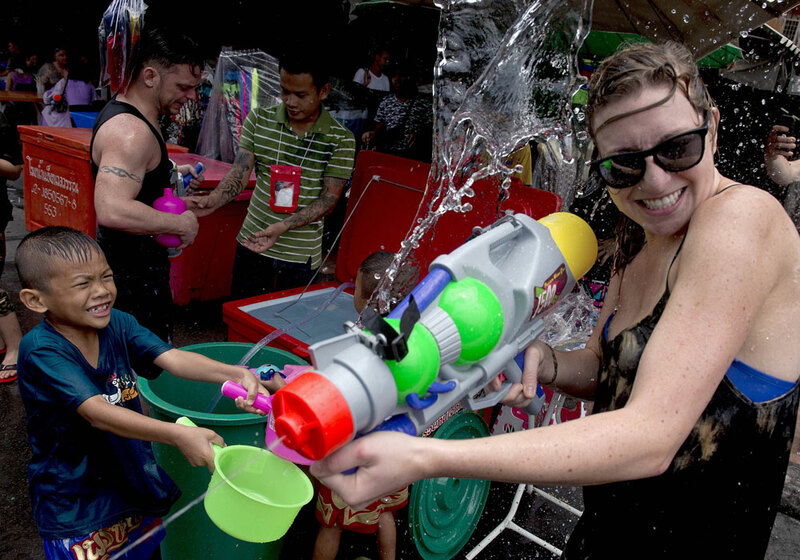 In Songkhla's tourist and business district of Hat Yai, many foreign visitors - mostly from Malaysia, Singapore and Indonesia - mingled with locals at a "midnight Songkran" festival that runs until today. 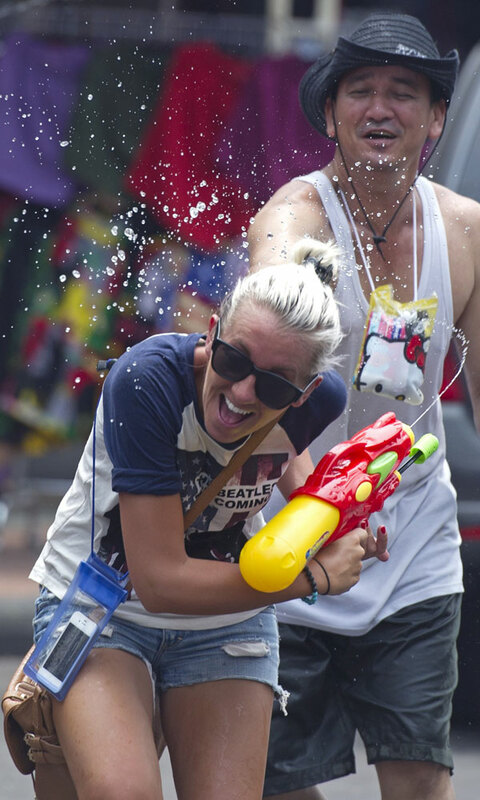 The Songkhla office of the Tourism Authority of Thailand estimated that foreign tourists would generate revenue of at least Bt300 million (S$11.6 million) this Songkran. 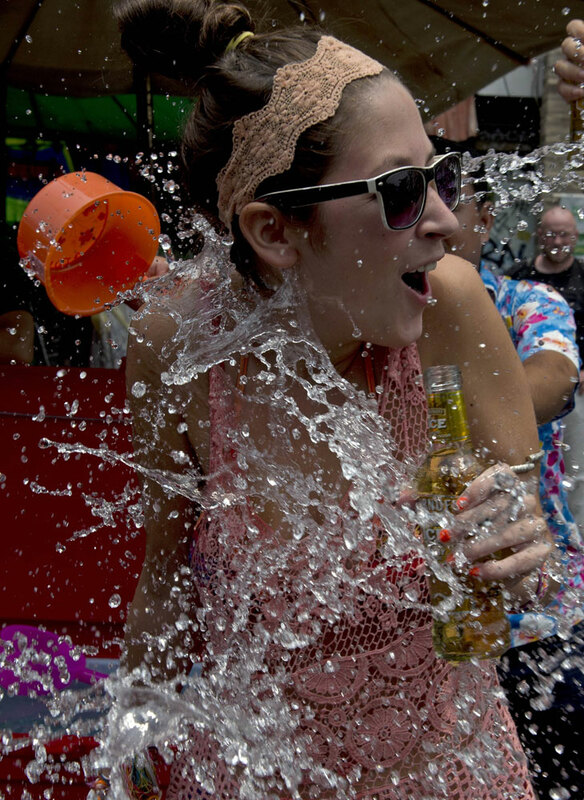 A festive mood reigned all over the country, even in the restive southern border region. 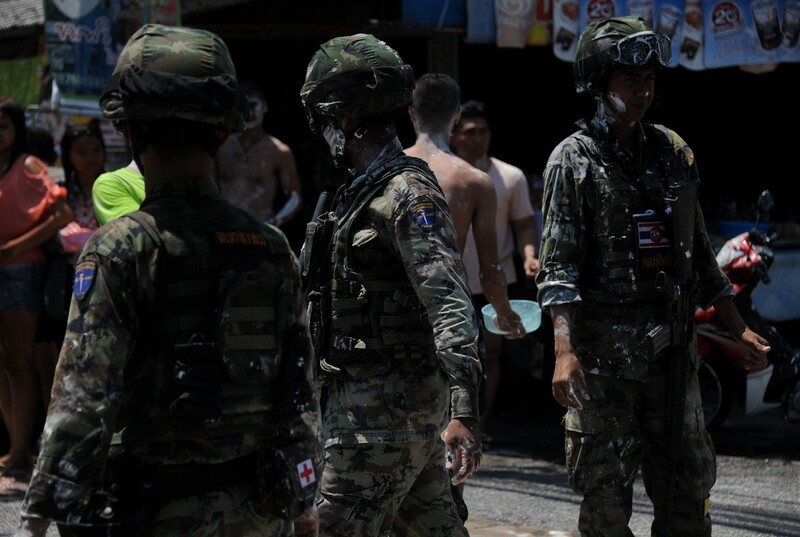 Soldiers armed with assault rifles stood guard at public places in Narathiwat while young locals splashed water at one another. 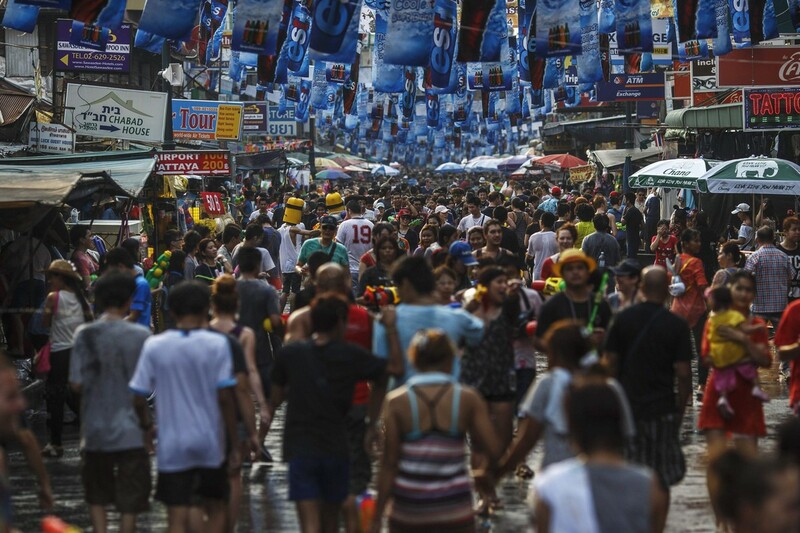 The anti-government People's Democratic Reform Committee (PDRC) is holding Songkran celebrations at its protest site inside Lumpini Park. 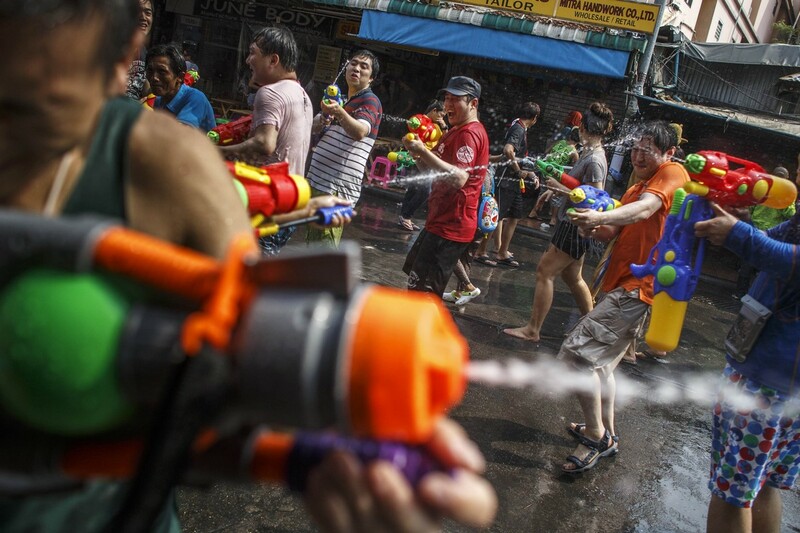 PDRC leader Suthep Thaugsuban announced that the group had no plans to rally outside the compound during Songkran. 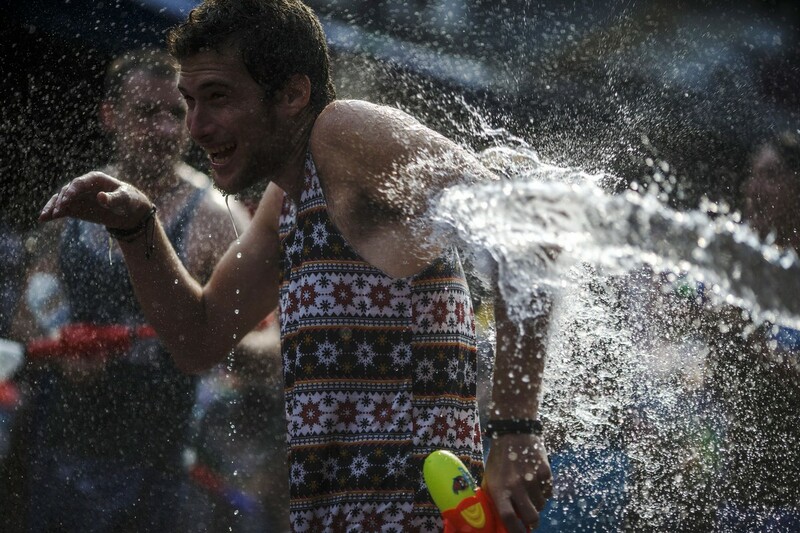 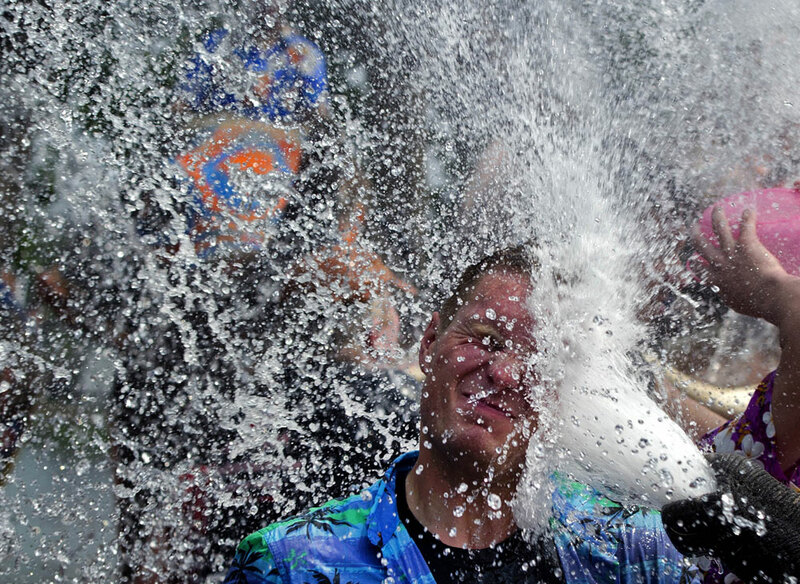 Protesters in colourful clothes took part in water fights. 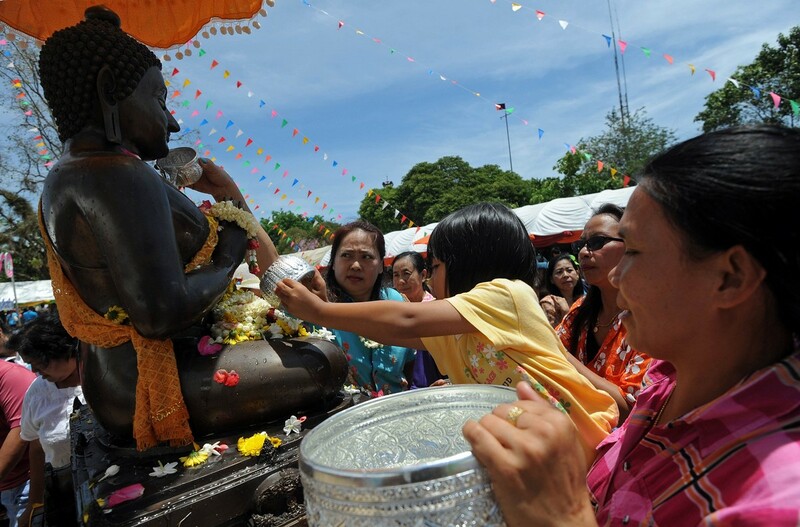 At the PDRC protest site on Chaeng Wattana Road, which is led by monk Phra Buddha Issara, people took part in activities including a religious ceremony performed by Buddhist monks. 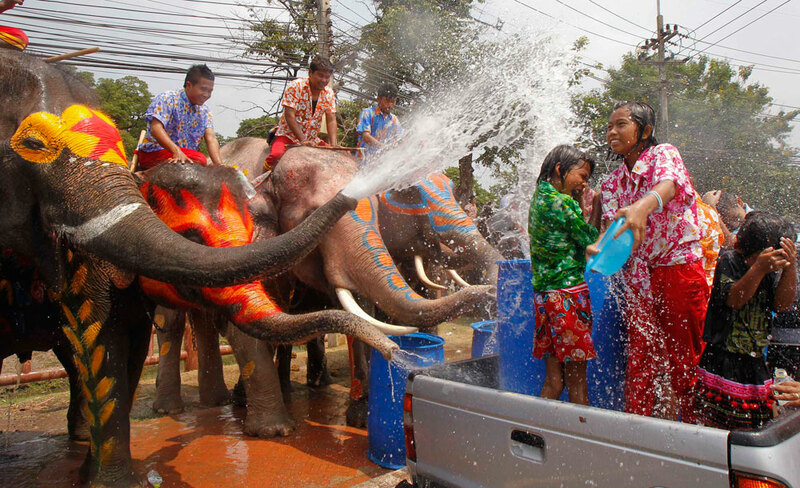 Younger participants also joined a traditional water-pouring ceremony for the elderly. 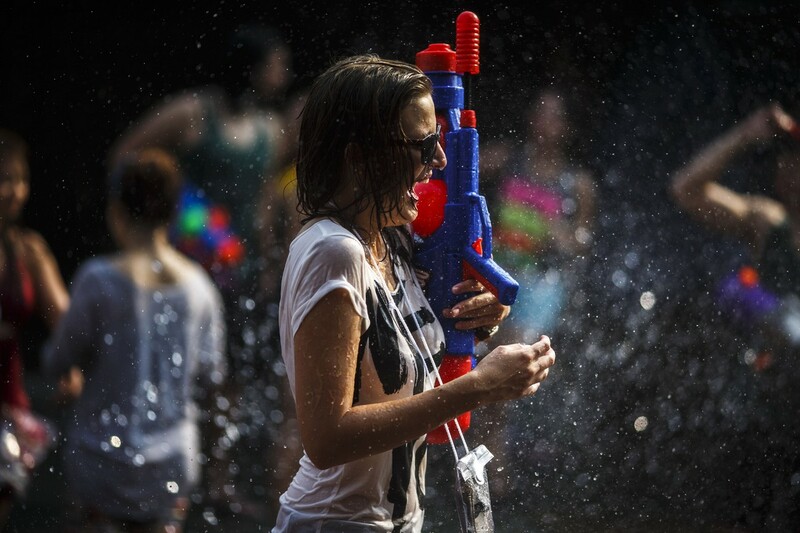 Meanwhile, the Student and People Network for Thailand's Reform (STR), another anti-government group, holds its Songkran celebration from today at its protest site outside Government House. 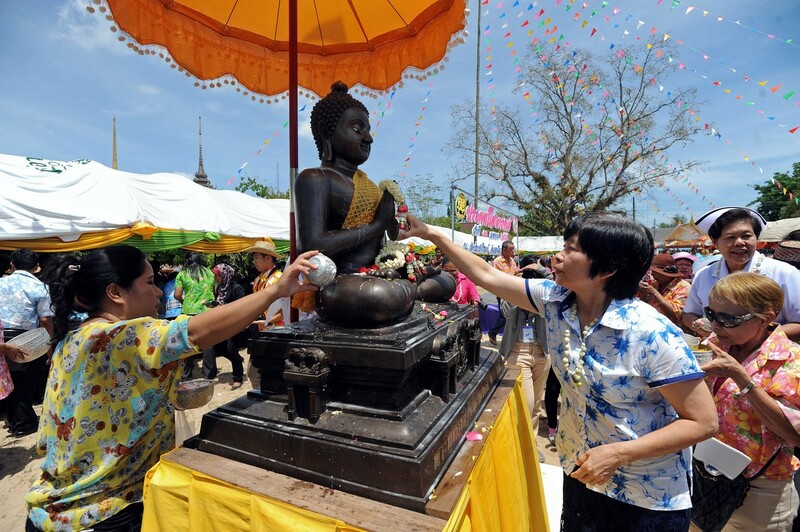 Many protesters at the site have returned home to the provinces to celebrate the festival with their families. 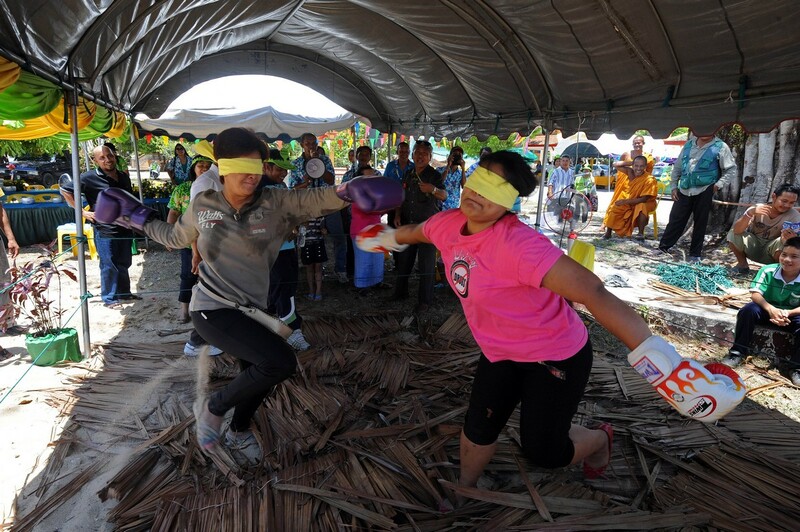 STR coordinator Uthai Yodmanee said the activities were aimed at relaxing protesters during this festival, adding that the celebrations would run until Tuesday. 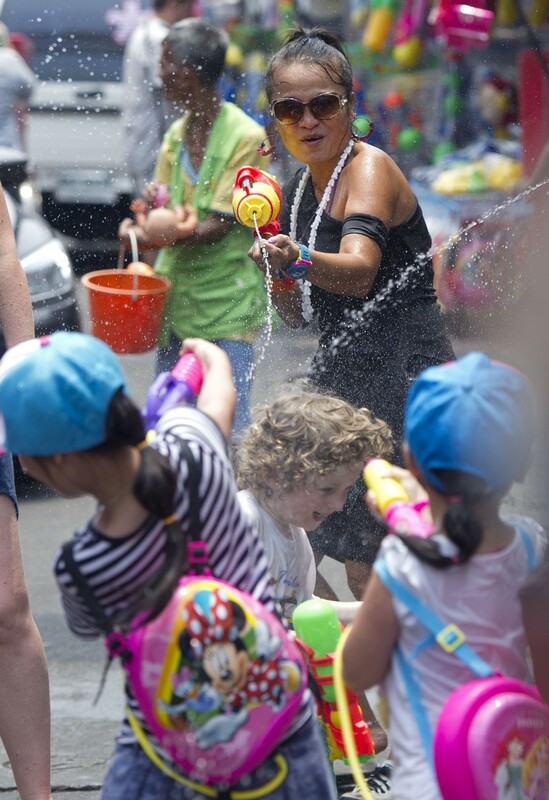 A Ferris wheel and a carrousel were installed at the site yesterday. 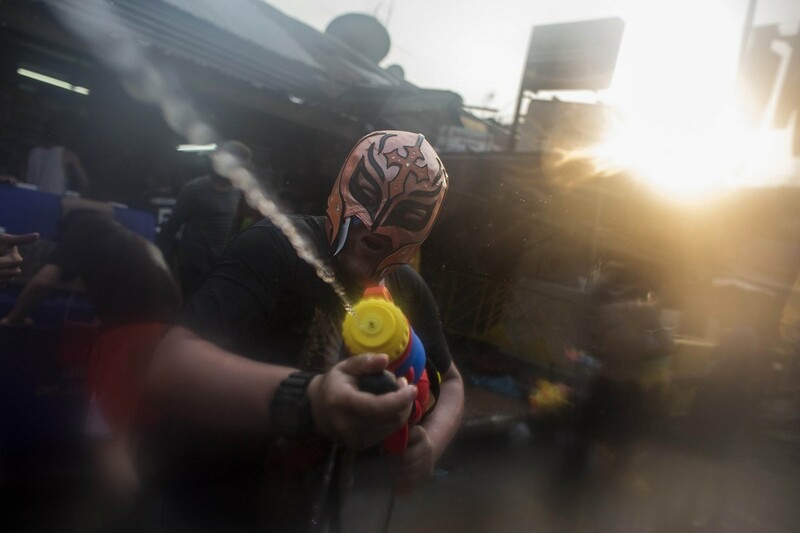 The ruling Pheu Thai Party's deputy spokesman, Anussorn Iamsa-ard, said it was good for all the conflicting sides to have a "truce" during Songkran although it was possible that "the confusion" would resume after the holiday. 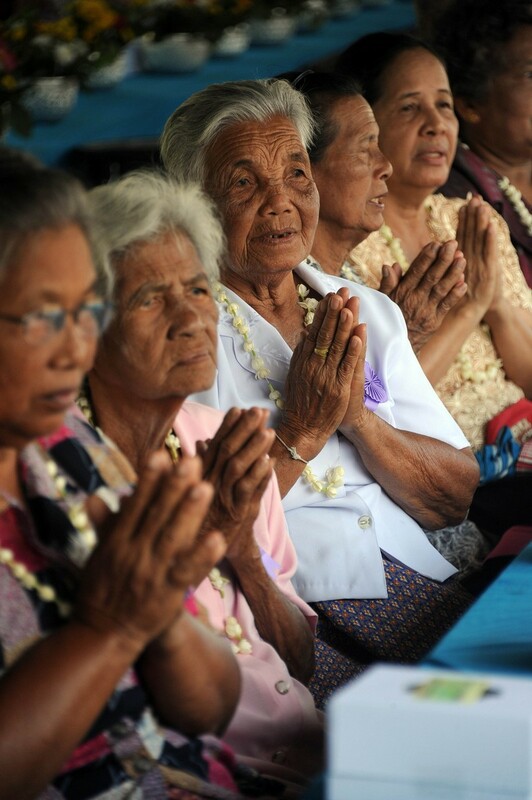 He said the party proposed seven measures to "bring back happiness" to the Thai people after Songkran. 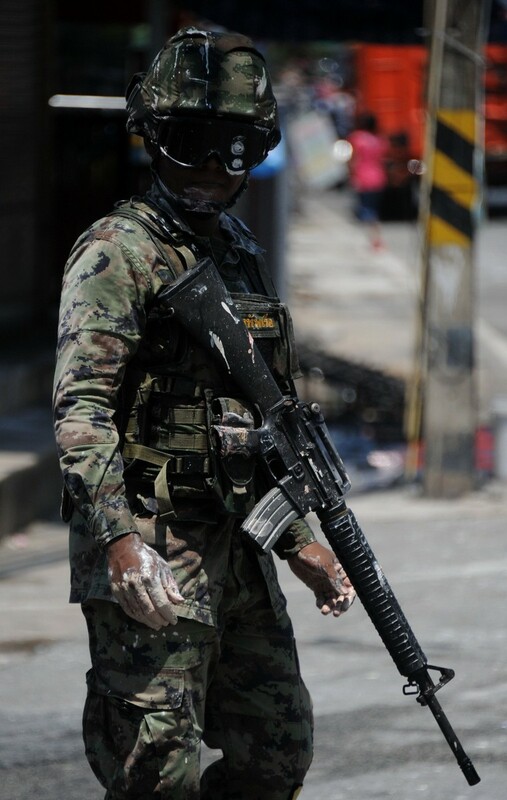 These include holding a new election soon, the independent agencies working straightforwardly, the military not becoming a political tool for the anti-government group, and national reform through constitutional means. 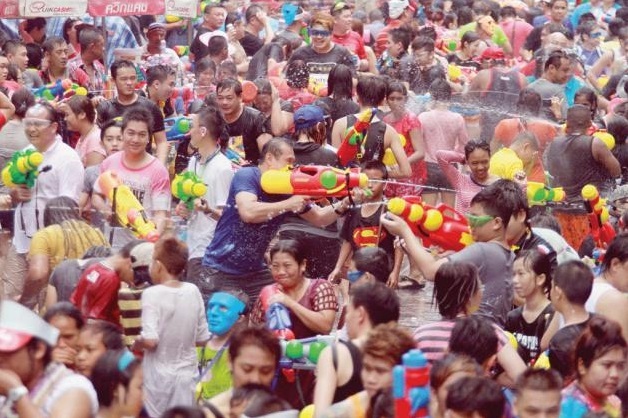 The opposition Democrat Party, meanwhile, asked Pheu Thai and Prime Minister Yingluck Shinawatra to sincerely respect the law as a present for the country during Songkran. 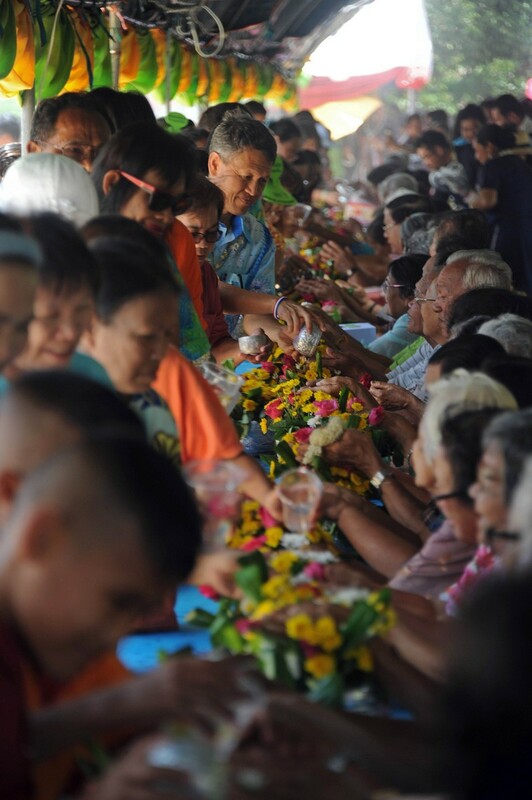 Democrat spokesman Chavanont Intarakomalyasut said that Pheu Thai should also propose to the public its plan for reforming Thailand, adding that the party had completed its national reform plan in seven aspects. 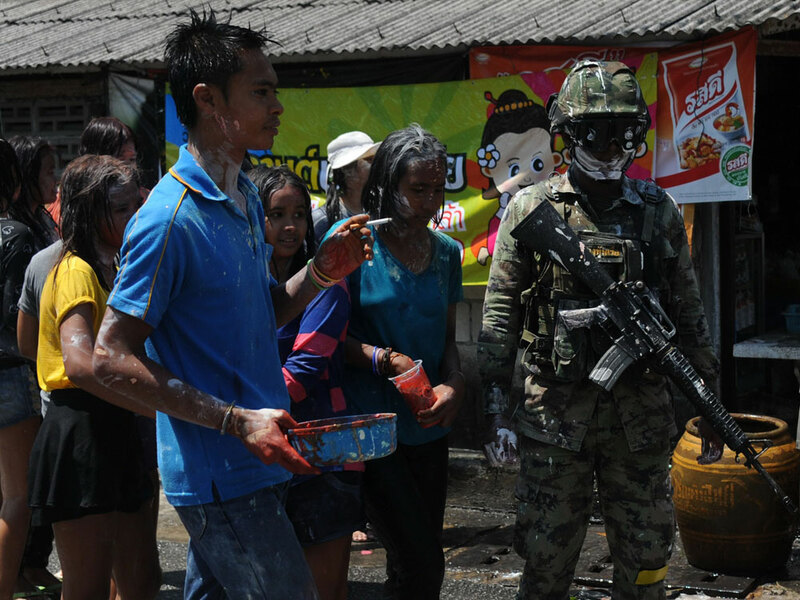 Thai soldier stands guard next to villagers celebrating the Songkran festival in Narathiwat. 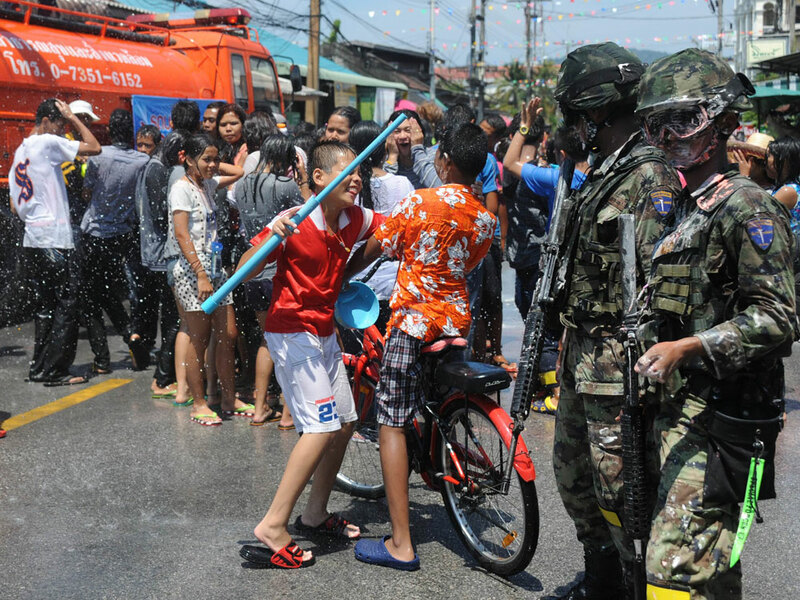 Thai soldiers stand guard next to villagers celebrating the Songkran festival in Narathiwat. 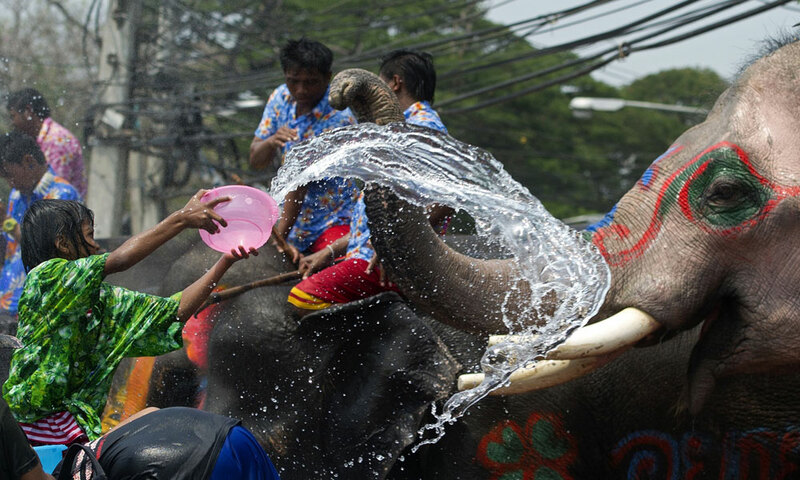 A Thai man splashes water on a tourist in Khao San Road in Bangkok. 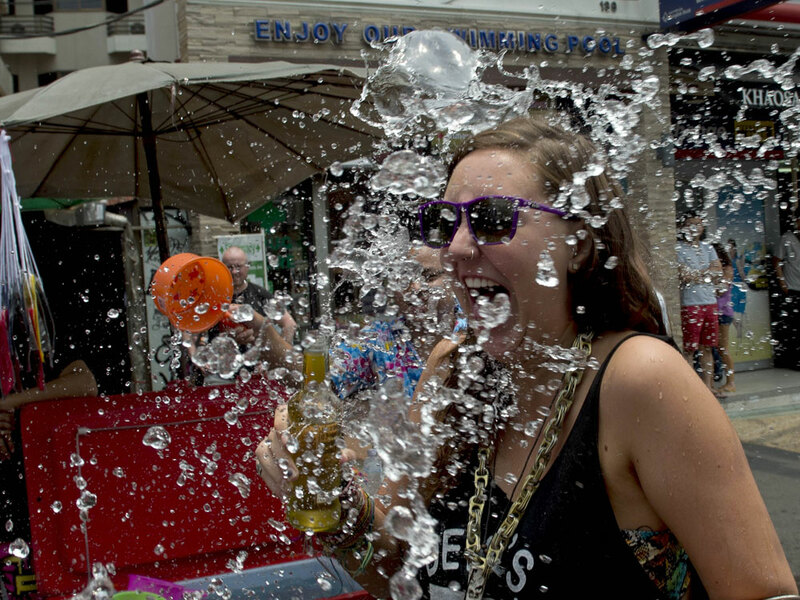 Man splashes water over a tourist in Khao San Road in Bangkok. 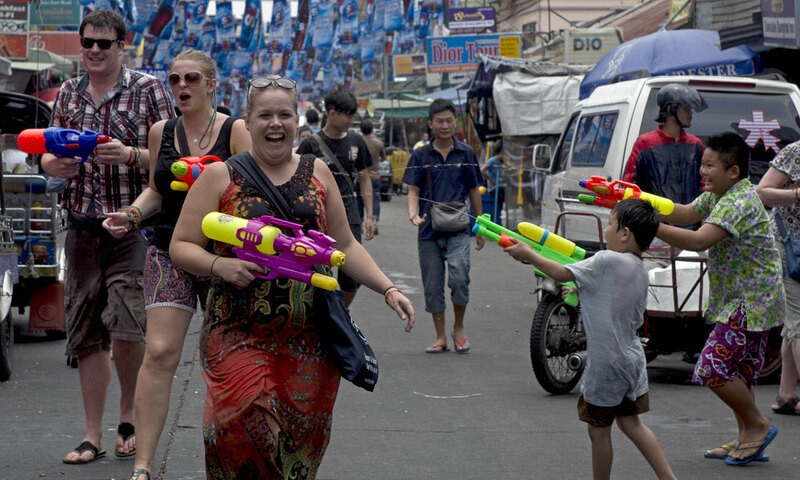 Thai children and tourists enjoying Songkran with water guns. 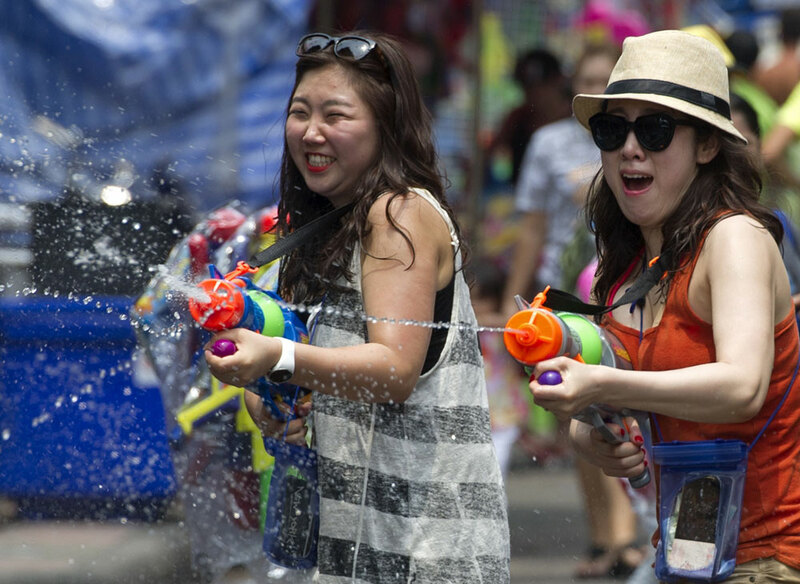 Foreign tourists enjoying the water fun at Khao San Road in Bangkok. 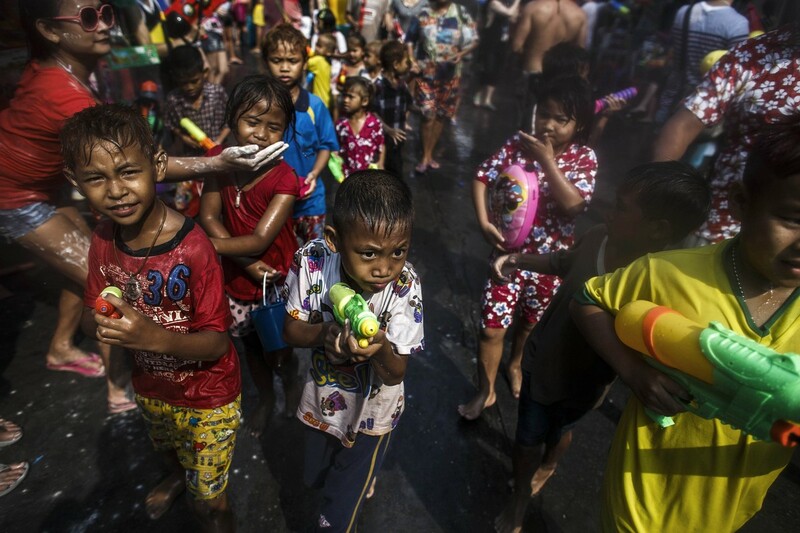 Songkran or Halloween? 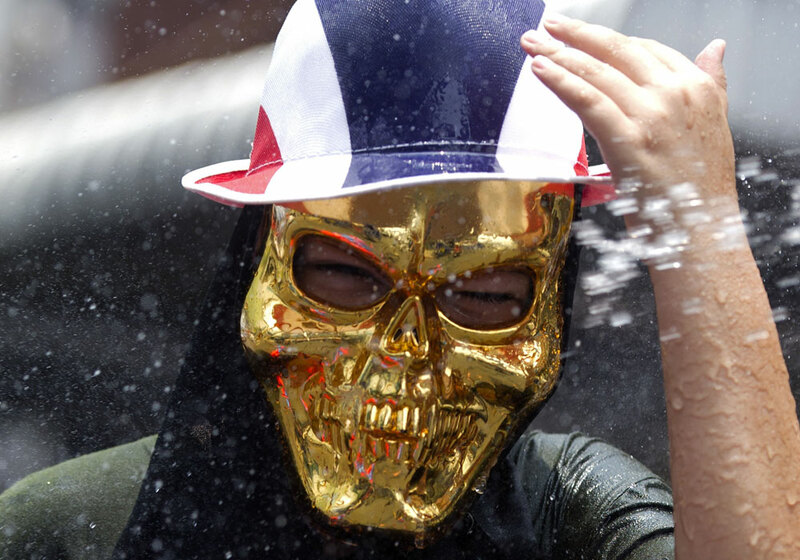 A Thai child in a skeleton mask takes part in the festival. 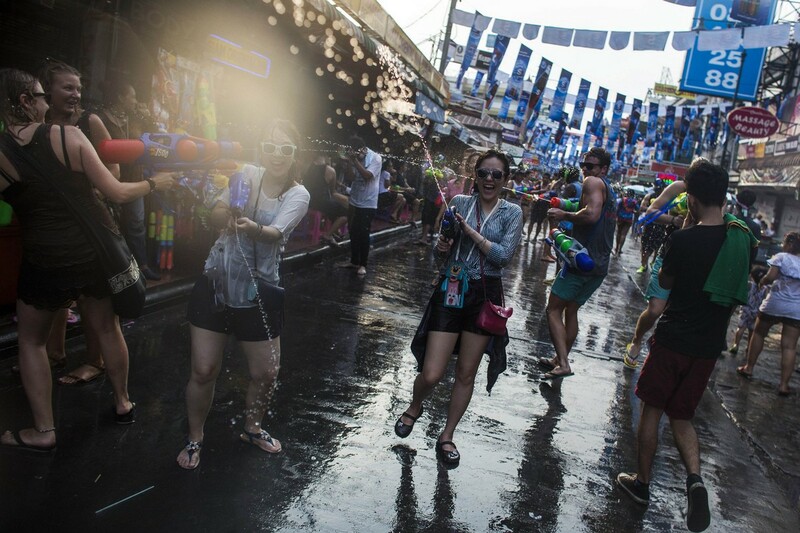 A water battle in Khao San Road in Bangkok. 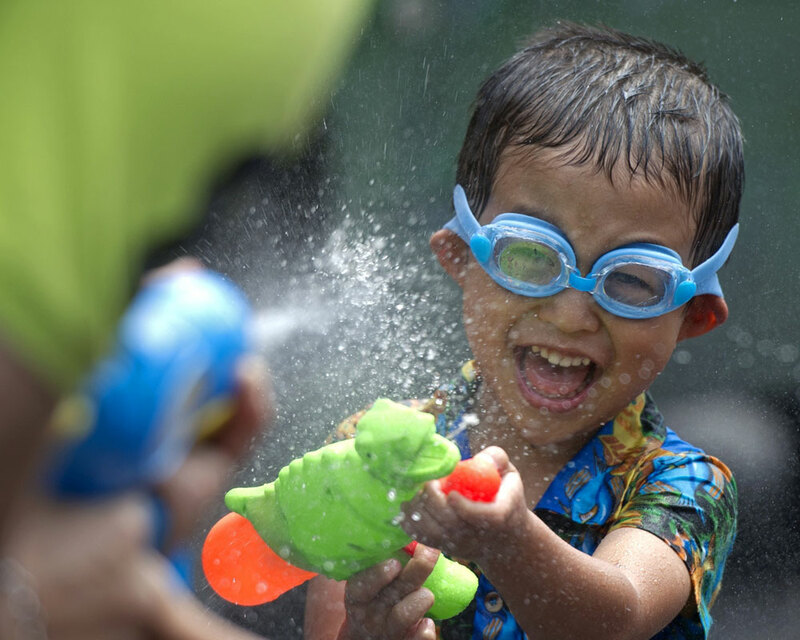 A Thai child having fun with his water gun. 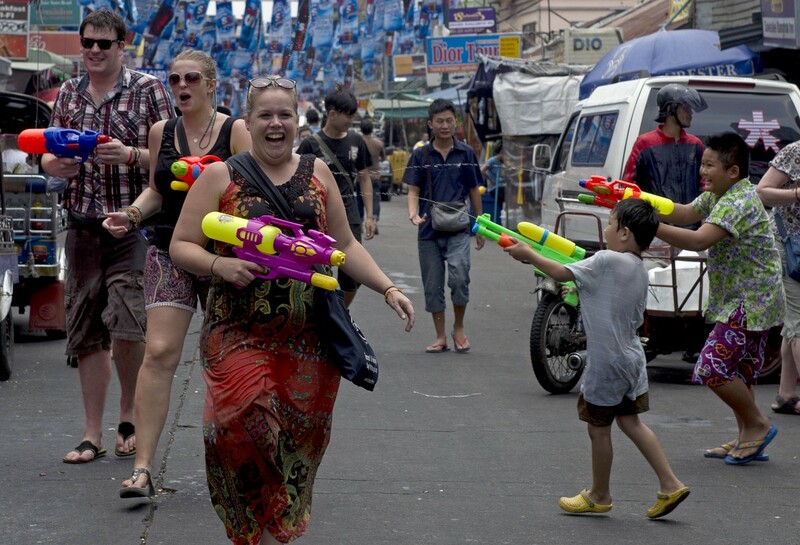 Water battles in Khao San Road in Bangkok. 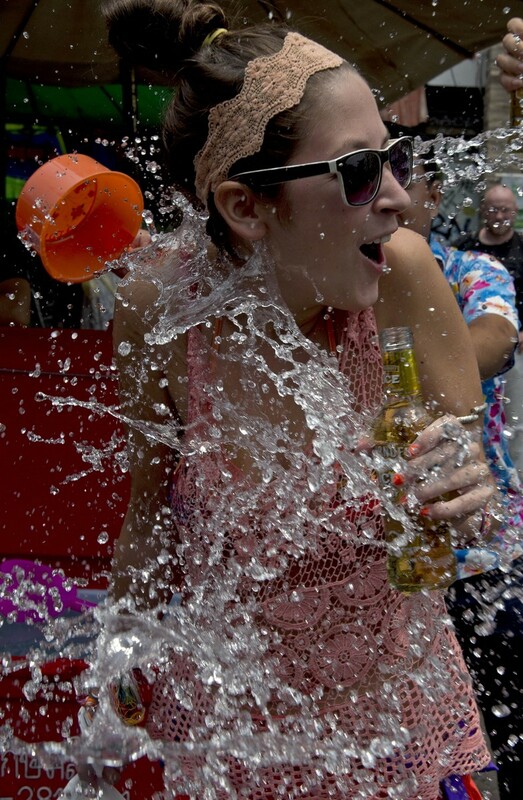 A Thai man splashes water on a tourist in Khao San Road. 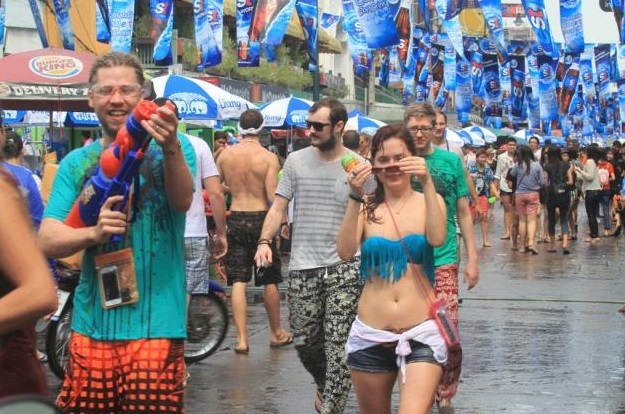 Tourists taking part in the fun water battles in Khao San Road. 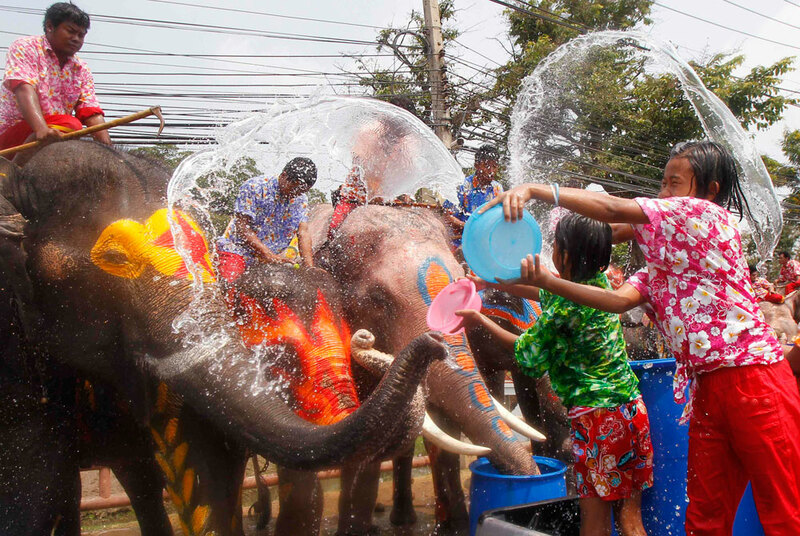 A Thai girl splashes water at an elephant as people celebrate ahead of Songkran festival at Ayutthaya on April 9, 2014. 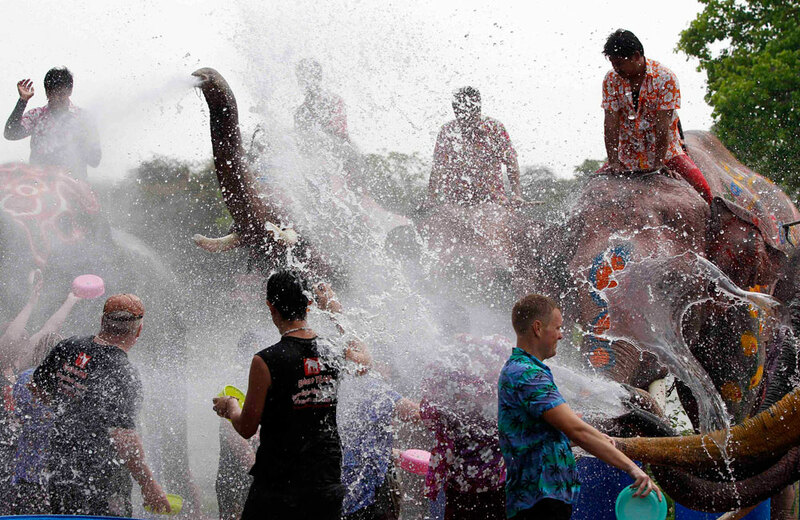 Elephants spray water at tourists in the celebration in Ayutthaya on April 9, 2014. 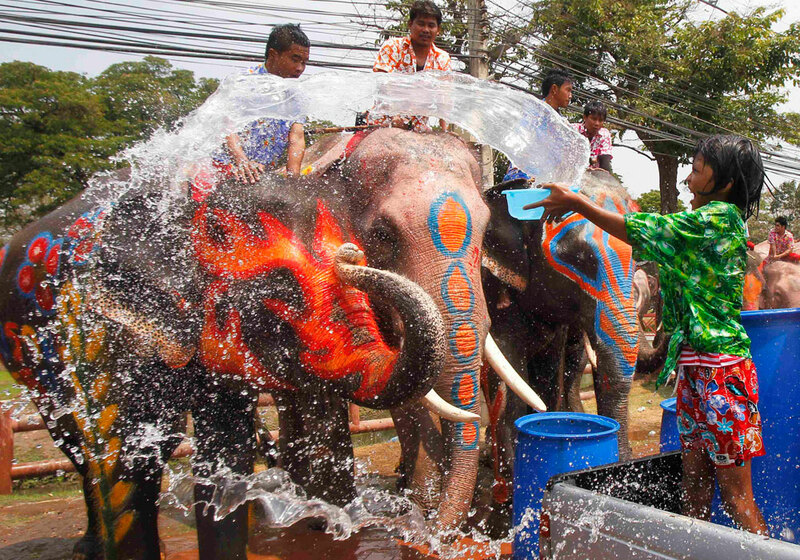 Children splash water on elephants at the celebration in Ayutthaya on April 9, 2014.